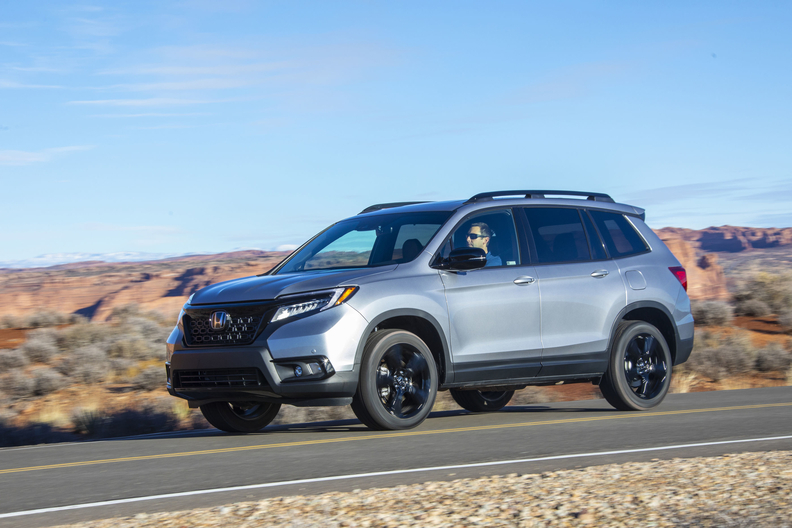 Honda Motor Co. said the 2019 Passport will start at $33,035, including shipping, as the automaker looks to make up lost ground in the two-row midsize crossover segment. The Passport will be offered in four trims -- Sport, EX-L, Touring and Elite -- and is to go on sale next week. All Passports are powered by a 3.5-liter V-6 engine that generates 280 hp and 262 pound-feet of torque combined with a nine-speed automatic transmission. All Passports also come standard with Honda's Sensing suite of safety features. This includes forward collision warning, lane keep assist, road departure mitigation and adaptive cruise control. Passports in EX-L and higher get standard blind spot monitoring. All-wheel drive adds $1,900 to each trim level except the range-topping Elite, on which it is standard. The automaker expects the awd take rate on Passport to be high. "This customer, we think, is going to be a lot of awd," said Jay Joseph, assistant vice president of product planning at Honda, during the vehicle's media introduction last week. "We're thinking this will be relatively high because this is somebody who doesn't need a third row. They're at a life stage where their priorities are having that freedom to go anywhere, anytime. We do see a much higher percentage of awd in Passport than we do, say, for Pilot." The base Sport trim comes with cloth seats, while higher trims get leather seats. Sport trim gets a 5-inch infotainment screen, black 20-inch wheels, two USB ports and remote start. The EX-L trim starts at $37,455, including shipping, and gets heated front seats, a moonroof, four USB ports and a power liftgate. EX-L and higher trims get an 8-inch touch screen infotainment system with Apple CarPlay and Android Auto. Honda expects EX-L to be the volume Passport trim, projected to account for roughly half of the nameplate's sales. Touring starts at $40,325, including shipping, and adds navigation, front and rear parking sensors, heated rear seats, roof rails and a premium audio system. The Elite trim begins at $44,725, including shipping, and piles on creature comforts such as ventilated front seats, a heated steering wheel and a wireless phone charger. Honda's two-row crossover carries a higher starting price than most of its competitors. The Passport's competition includes the Chevrolet Blazer, which starts at $29,995; Ford Edge, at $31,990; Nissan Murano, at $32,315; and Toyota 4Runner, at $36,005. Prices include shipping. The three-row Honda Pilot, to which the Passport is closely related, starts at $32,495, including shipping, for the base LX trim. Honda noted that the Passport's Sport trim, in terms of features, is closest to the Pilot's EX trim, which starts at $35,375, including shipping.